Shares of mining and diesel engine equipment giant Caterpillar Inc. slumped in early trading on Tuesday. The decrease in the share price came following an announcement that the company would be moving its world headquarters from Peoria, Illinois, where the company and its predecessor have been based since 1910, to Chicago. 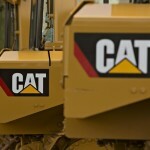 Shares of Caterpillar (NYSE:CAT) opened the day at $96.57 (£76.77), but by 10 AM had dropped to $95.51 (£75.93) following the announcement of the planned move. By noon, shares had fallen still further, reaching $94.95 (£75.48). The first half of the trading day represented a loss of value of more than 1.6 percent. The fall came only days after shares of Caterpillar reached their highest level in two years on January 27th, topping out at $98.99 (£78.69). The announcement of the heavy equipment firm’s planned move to Chicago was explained as a means of better accessing clients from global markets via Chicago’s O’Hare International Airport. According to the official announcement, Caterpillar plans to lease office space for its new headquarters, rather than construct an entirely new facility. The migration of company executives and essential personnel to the new world headquarters is expected to take place by the end of this year. Despite officially relocating its long-time world headquarters, many of Caterpillar’s day-to-day business functions will still be handled in the Peoria, Illinois area. According to the announcement, most of the company’s manufacturing and engineering base, including its technology and development center, will not be following the world headquarters into Chicago. For most of its history, the manufacturing giant has been one of the core economic drivers in the city. As of 2015, a plan had been put in place to build a new world headquarters campus in Peoria in the area of the current headquarters building. Even though the company’s move comes after a period of protracted losses and employee layoffs that have driven share prices down considerably over the past two years, the decision to move Caterpillar corporate headquarters is not expected to have any massive implications for the company as a whole. Despite the change in location, Caterpillar is largely expected to follow the business model it had previously devised for weathering this period of decreased profits.